Discussion in 'Making Money' started by twotnwo, Jan 18, 2018. 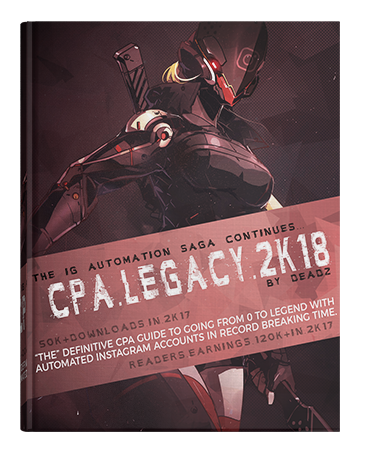 15+ PAGES WITH IN DEPTH EXPLANATION ON HOW TO MAKE MONEY WITH CPA USING AUTOMATED IG ACCOUNTS! I've decided to write a new version of my IG+CPA guide. In this one I go more in depth on IG+CPA and everything I've learned up until now since started doing the method myself back in 2016. Also by starting this thread and helping others, I've manage to learn way more about the method than I expected at first. And I've included all of that in this guide. This will make it easier for people to get started and also save people the time of having to read through the whole thread and/or ask questions. Instagram bot running 24/7 on a VPS, auto following/ liking followers of the targets you put in. People see your profiles in their notifications, they click, they read, they want followers, they click on your link, they go to your pre-lander (or redirected via your cloaker), they go trough to your premium landing page, they're convinced they fill in their username and select the amount of followers, boom! they have to verify that they're human before they get their followers, they're still convinced, they complete offers.. I advise that you read through the guide and take notes if you need too. I also included some extra resources to help you out! You can also ask me anything about this method on this thread! Please note: This is not me offering to coach/mentor anybody! That being said, I do go out of my way to help someone if I see they are taking action! Looks interesting as always. Thank you for the share. Looks cool, thanks for the share!